It was a busy day at Linderhof -- time to decorate the garden for winter -- filling the pots that didn't have pansies with pine cones and/or greenery and putting some "tree toppers" (which look like little Christmas trees) into two of the urns. And then the roping around the front door and filling the Asian bowl on the porch table with more pinecones and filling the iron urn on the porch with greenery and sugar pine cones. But Linderhof both outside and in is decorated for Christmas -- the tree is up, there are poinsettias around, and greenery on the mantles. And besides working outside I managed to make a batch of bourbon balls -- for they, like the Dundee cakes, need to "age" to be really good! A simple supper was in order -- a ham steak and a platter of roasted root vegetables. It's an easy recipe -- the hardest part is peeling the butternut squash. Once the vegetables are peeled and cubed, toss them with olive oil, salt and pepper and put in a 425 oven for about 25 to 35 minutes until they tender and caramelized. It's an Ina recipe so you know that it is both easy and good! And especially nice sprinkled with minced parsley from my windowsill plant! The nicest thing is that it makes a lot of vegetables for two persons and so tomorrow we shall enjoy roasted root vegetable soup for lunch! Cut the carrots, parsnips, sweet potato and butternut squash in 1 to 1 1/4 inch cubes. All the vegetables will shrink while baking, so don't cut them too small. Place all the cut vegetables in a single layer on 2 baking sheets. Drizzle them with olive oil, salt and pepper. Toss well. Bake for 25 to 35 minutes, until all the vegetables are tender, turning once with a metal spatula. It's Friday which means that it's Foodie Friday so please join Michael at Designs by Gollum to see what other delicious dishes there are this Friday! Yummy! I've used Ina's recipe before with some slight variations. We chose potatoes, carrots, red peppers and onions. I, too, am finally finished with the decorating. Two busy days at the store, a celebration and then the baking and wrapping will begin. Thanks for sharing this recipe! Martha, I love that recipe and it looks especially lovely in your presentation. That's my favorite winter vegetable recipe - the flavours are wonderful. I love your presentation. 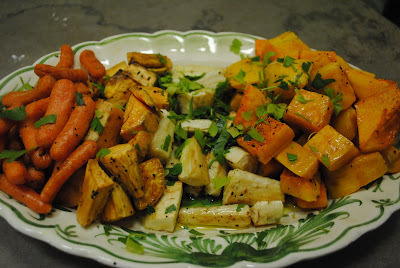 Delish to the roasted root veggies! We started decorating our backyard garden for winter and the holidays last year. We draped the fence around the veggie garden in greenery and added some embellished baskets and such. Also put a string of lights around the garden...it made me so happy! I hear you on peeling the butternut squash! Since roasting vegetables became popular, it's hard for me to eat them any other way. Delicious! Wish I had a parsley plant on my window sill. The kitchen is clearly the heart of the home, as you've proven with this wonderful "simple supper" you've shared. Thank you for opening your home to online visitors like us! What a lovely blog, I can't wait to visit again. Thanks. Good to know I'm not the only one who finds butternut squash a bear to work with.